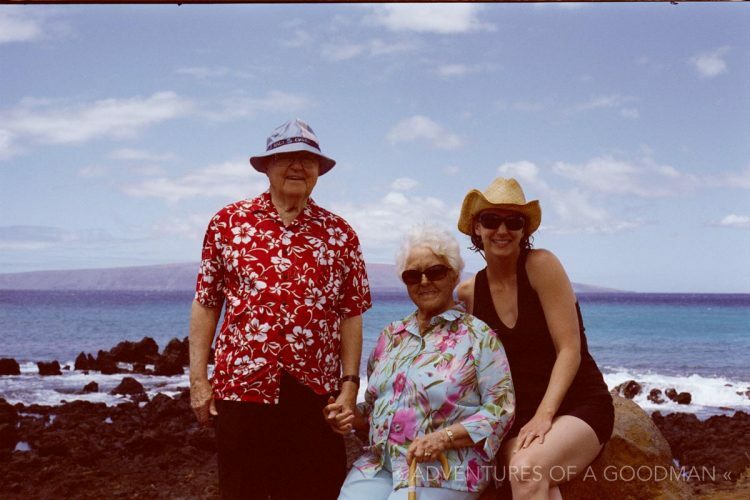 We lovingly refer to it as our honeymoon-ish: the first trip we took as husband and wife – to Maui, Hawaii – with Carrie’s 89 year old grandmother and her 91 year old husband. In addition to my dSLR, I also brought my old Pentax 35mm film camera. This photo was scanned, but otherwise left completely unedited. This post is a tribute to Mary and Ron: two of the kindest and wonderful people I ever have known. We imagine that traveling with them is a small glimpse into what raising a family will be like: assuming our kids turn out to be smart, opinionated and capable with fascinating stories about World War II. Our whole experience in Maui was fun, tiring, educational, frustrating and wonderful: all at the same time. If there’s a choice between watching an old movie or going outside, there’s a 50% chance the great outdoors will lose. For the better part of a year, my wife Carrie and I have been trying to take Mary and Ron to Maui on vacation. They have fond memories of previous visits and wanted to go back while they still physically could. After a few false starts, we finally booked a date more than a month after our wedding. However, when unforeseen circumstances canceled our Mexican honeymoon, the Maui vacation wound up as our first post-marriage trip. You know, the trip people usually call a Honeymoon. Before leaving, Mary and Ron spent weeks bragging to their friends at the retirement home about how they were coming along on our honeymoon. People were baffled and confused; but we couldn’t have been more excited. Nor could we have had less of an idea of what we were getting ourselves into! Upon arriving at San Jose International Airport, we were greeted by porters with wheelchairs and Carrie and I watched in amazement as they were pushed right up to the front of every line. I’m talking from check-in, through security and onto the plane in around 20 minutes. The best part? One of the porters got a handful of quarters for his tip! I take that back, the best part was when the Alaska Airlines flight attendants declared them as the “most awesome people on the plane” and gave them both beautiful lais just before landing. Arriving in Hawaii was a bit more work than leaving California. Wheelchairs were waiting for us, but they were without porters. We could have waited 15 minutes for them to arrive, but instead Carrie and I decided to push Mary and Ron ourselves while dragging our carry-on luggage behind with our one free hand. We tried to make a race out of it, but Mary and Ron didn’t find it nearly as funny as Carrie and I did. A week later when it was time to leave I learned that even a 91 year old World War II veteran is not exempt from a full body check if he has a metal hip. It was absolutely disgraceful to watch as airport security made poor Ron stand there for 5 minutes while they basically felt every inch of his body. Just horrible! OK, We’re in Our Maui Condo. Now What? We figured it would be a lot of relaxing, sitting on the balcony and watching the waves crash. Maybe take a few road trips and explore the island? Head up to the volcano? One day after Mary and Ron attended church, we drove down the most Southern road in Kihei and reached the ocean and the end of that portion of Maui. Curious as to what we ACTUALLY did? Then read Part II of My Hawaiian Honeymoon With 90 Year Olds. Highlights include mosquito attacks, a Baywatch moment and trying to board a sunset cruise from a very wavy beach. Can I Live Off Groupon For A Year?